University IT dept. 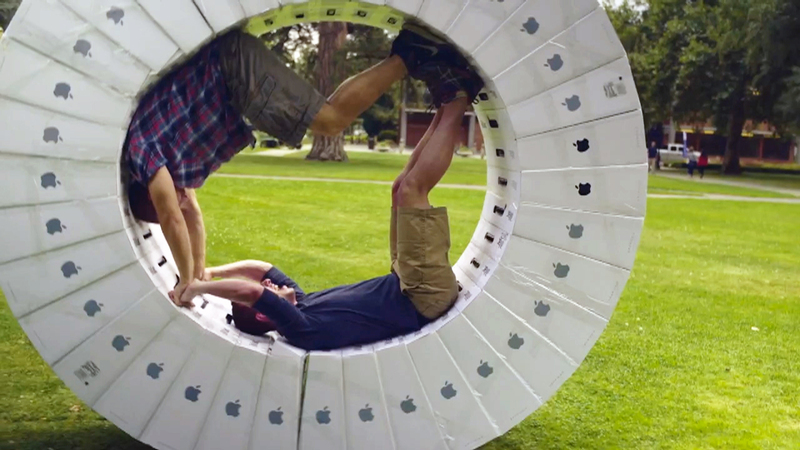 creates giant wheel out of iMac boxes, on The Feed! Some of the latest and greatest viral videos include a new way to roll out the latest Apple product and an interesting encounter between a group of elephants and a GoPro camera. The boxes for iMac computers are trapezoids, with the front 10 degrees off from being parallel with the back. So, if you combine 36 of them together, you get a perfect, 360-degree circle. Which, combined with a bunch of packing tape, is exactly what the IT department at George Fox University in Newberg, Oregon, did -- creating what they've dubbed the "iWheel." Now that's thinking outside the box. Out in the wild, one doesn't come across to many electronic devices. That might explain why this group of elephants are so intrigued when they encounter a GoPro camera. They examine it and play with it for a bit. And, though they eventually leave it behind, it's an experience they'll always remember.